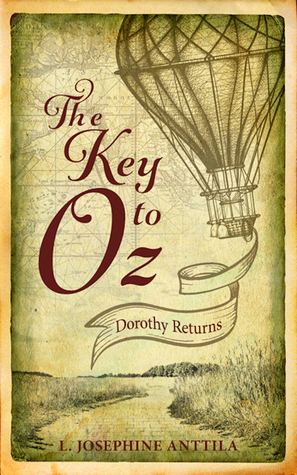 When Dorothy Gale (of the Kansas Gales) boards a ship bound for Australia she doesn't dream that she’ll soon be returning to the familiar faces of the Land of Oz. There, Dorothy meets a host of colorful new characters whose friendships drive her to journey through the ups and downs of the physical and political terrain of Oz when they fall into trouble. Along the way, Dorothy encounters a talking raven, an unexpected travel companion, a mysterious key, the evil Nome King, and Princess Ozma of Oz herself. But when Dorothy is captured in her attempts to aid her new friends, she realizes that the only way to escape and protect those she cares about may be to risk everything. A whimsical escape into a familiar land, The Key to Oz leaves readers (and Dorothy herself) guessing until the close. As Dorothy makes important realizations that people are not always as wicked as they first appear, true love knows no bounds, and that there is untold magic in everyday things, readers will be left wanting more of the Oz that Anttila so artfully weaves in this outstanding debut novel. It's been a good long while since I've honestly felt like I've been sitting around a table workshopping a story, but this book brought all those feelings back as if I'd never left that tiny, fourth floor room in the first place. There are things you learn in beginning writing classes, but one of the main ones that will haunt you like that one thing you said to the person you perhaps had an awkward crush on in middle school that will absolutely pop into your head at 3am when you're just trying to sleep: Show, don't tell. The Key to Oz is telling, and through that compositional choice loses quite a lot of things it could've had going for it otherwise. The book lacks any real sense of urgency even in scenes where there absolutely should have been. Lacking urgency means there's no real tension which then translates into a book where it's nigh on impossible to connect with the characters in even a superficial way. A book that is a couple hundred pages of essentially summary with bits of dialogue thrown in (dialogue that, mind you, takes over 20 pages to first appear in the book anyway,) though sometimes even that is summarized by the text as well. I get it, I do. In real life when verbally telling a story to someone the tendency is to go 'and then they talked about what they were going to have for dinner for a while and whatever doesn't matter, not relevant,' and move on. Here's the thing in fiction: Everything matters. All of it. Say, for example there are two roommates sharing an apartment and one bedroom is described as having mismatched older wooden furniture clearly either picked up at thrift stores or inherited in some way from someone else. The other room is all brand new sleek looking but ultimately cheap particle board that makes the space look like something off a design blog. Both these spaces say something about the people who occupy them. They might be good things, they might not, but they say something and what says more is when you get to those shared spaces of this hypothetical apartment where 'grandpa's dresser' and 'Ikea chic' collide and find themselves having to strike a balance. Maybe Ikea Chic doesn't plan on moving and so isn't worried about the particleboard falling apart or had to find themselves furnishing whatever space simply based on what they could afford to have delivered because getting a truck to grab that cool metal bed frame off the side of the road wasn't an option? Perhaps Grandpa's Dresser has furniture that doesn't match because they wanted something that lasts and are in the process of personally refinishing it all so that it might eventually look like Ikea Chic's room? The descriptions of places carry weight. The descriptions of people carry weight. And, I can't stress this enough: small talk matters. Yes, it seems like nobody likes it in real life, but if there are two characters who are going to get into an argument about dinner either show me the argument about dinner or make it a narrative point somewhere in the text that this is something that happens constantly enough that the argument about dinner might've stopped being about dinner 2 years ago and is just a front for something else. Do not, please, please do not just sit there and go 'and then they talked about dinner' especially after pages of 'this happened and then this happened and then this etc.' If something legitimately doesn't matter, don't include it. The Key to Oz was a book I was really, really excited for when I first read the summary. What I was expecting was an engaging world that built on the source material's beginnings instead of using them as a crutch. What I got was so much summary of events that I couldn't bring myself to care whether or not Dorothy lived or died. They could've suddenly collided with, say, the Pacific Rim universe and it wouldn't've mattered because giant robots and monsters probably would have been given the same underwhelming and lackluster treatment as everything else. I like it when books make me feel something. That's part of why I love reading. I want to get caught up in whatever world the author invites me to. Heck, I can't count the number of times I've finished a book and gone 'omg this is so awful you need to read it right now.' However bad that book being passed on was as a book, it was at least successful in making me have an emotional reaction to it no matter how positive or negative said reaction was. The absolute worst thing a book can do, in my opinion, is leave me feeling nothing at all. The Key to Oz: Dorothy Returns was a chore to read. In the end, I still can't completely tell you what happened because I just didn't care. The only lasting impression I gained from the text was that I'd wasted my time.